Celebrate the Ultimate Symbols of the American West! Showcasing what’s been called, “The Last Great Legacy of the West,” the Wheels That Won The West® Archives has introduced a new series of wagon and heavy vehicle books. Entitled, Borrowed Time – A Tribute to The Wheels That Built The American West, these custom creations are an unparalleled ready-reference covering the farm, freight, ranch, coach, business and military vehicles/brands that played such a strong role in the development of the U.S. frontier. These are rare, signed copies from actual Springfield Wagon Company workers! 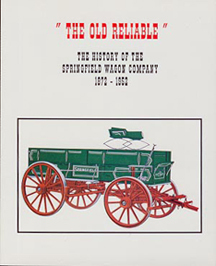 Years ago, we were able to purchase a quantity of new/old stock, books entitled, The Old Reliable - The History of the Springfield Wagon Company by Steven Stepp. Printed in 1970, the out-of-print book is not only full of details about Springfield but also many other well-known wagon makers. Along with our own research into the company, nearly a decade ago, I had the privilege of interviewing the last two surviving workers from the Springfield Wagon Company. Each was in his 90's at the time.